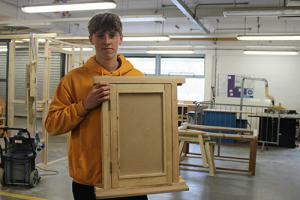 After enjoying a Taster Day at the College in Year 10, Aaron chose Carpentry & Joinery, as the experience confirmed the type of career he wanted to pursue. Aaron had the opportunity to complete a week’s work experience the summer before his course. Working on a loft conversion, he was given the chance to explore some of the skills he would be building on throughout his course. Aaron’s technical skills were put to the test in an internal College competition with the challenge of creating a gallows bracket. Aaron excelled with this task and secured first place! Aaron is passionate about a career as a Carpenter and is looking forward to progressing to the Carpentry & Joinery Level 2 Diploma.